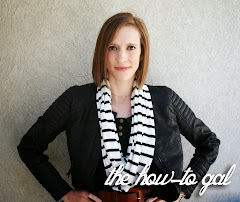 The How-To Gal: Quilt Party! Luckily, I have an ingenious mother who happens to be a fabulous quilter. She worked in a quilt shop that was having a contest celebrating quilt month. Each person who entered the contest was given a bag of different, yet matching fabrics and told to create a block. Once all of the blocks were collected, the quilter's names were put into a drawing and three people's names were drawn. The completed blocks were then split into three and given to the winners. 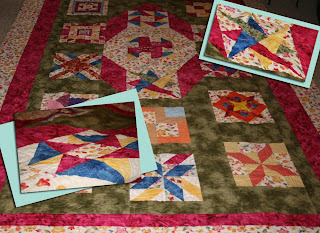 Three people walked away that day with enough blocks to make an entire quilt!!! My mom was one of those lucky winners and assembled the pieces into one of my most prized possessions. *Helpful hint: make sure all of the block patterns that you hand out with the invitations are the same size!